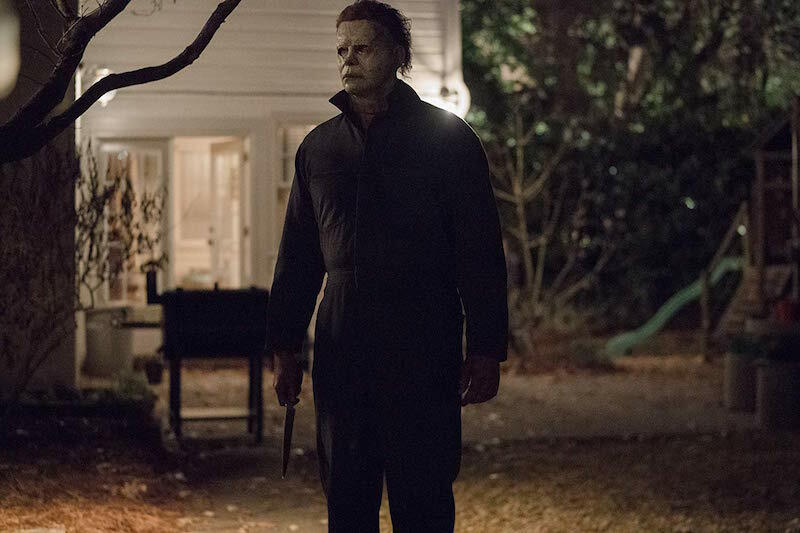 Michael Myers is back to his murderous ways again with this latest installment in the Halloween franchise that forgoes all of its previous movies with the exception of the 1978 slasher classic. The idea of positioning Halloween (confusingly, the third film in the series with that title) as a direct sequel set 40 years after the original is one of several potentially rewarding concepts that went into the development of this newest entry. Unfortunately, these decisions are overridden by the same trite storytelling techniques that we’ve seen countless times both in this series and in other slasher films for the past four decades. We’re re-introduced to Laurie Strode (Jamie Lee Curtis) as a grandmother who is still traumatized from her initial run-in with Michael Myers but who has also been actively preparing for what she sees as his inevitable return. We learn that this fixation with the masked killer cost her two marriages and the relationships with her daughter Karen (Judy Greer) and her granddaughter Allyson (Andi Matichak). When the prison bus that’s transporting Myers (played by both Nick Castle and James Jude Courtney) crashes, Laurie seeks to protect her family at all costs as the seemingly unstoppable evil descends upon Haddonfield once again. Director David Gordon Green has helmed both independent dramas and mainstream comedies in his prolific career but his inexperience with the horror genre is evident early on in Halloween. Whereas John Carpenter sets things up brilliantly with an unforgettable opening in the 1978 original, Gordon Green isn’t as successful in creating the same kind of chilly atmosphere that’s integral for scary movies to function. To his credit, he does cleverly invert some key moments from its predecessor for the sake of juxtaposition but there aren’t enough new ideas that stand independent from the ones that Carpenter developed all those years ago. It’s a shame that the script, co-written by Green with Jeff Fradley and comedic actor Danny McBride, relies so heavily on the kinds of well-worn cliches that they’d probably be better off skewering instead of embracing. Any of the comedy that does turn up, like two cops bickering about banh mi sandwiches as they wait for Myers to appear, feels forced and completely inorganic to the scenarios that arise from the plot. There is a meta moment, when a hapless teen unwittingly asks Michael “have you ever really liked a girl and you just couldn’t have her?”, that hints at a much more self-aware and potentially fun film that could have been. Instead, we’re treated to the same setups and slayings that I suppose are integral to this genre but each death seems to have less meaning as the runtime moves along. In the 1978 original, Michael kills 5 people; here, I lost count about 30 minutes in. It doesn’t help that the editing is particularly slap-dash and unexpectedly sloppy in places; I counted multiple instances in which the lines that an actor was speaking didn’t match with the movement of their mouth. Fans of this series may respond positively to this newest entry that also could reboot the franchise but for more casual moviegoers, Halloween is likely to come across as a rather hollow experience. Hunter Killer, starring Gerard Butler and Gary Oldman, follows a group of Navy SEALs aboard a submarine as they attempt to rescue the kidnapped Russian President. Mid90s, starring Sunny Suljic and Lucas Hedges, is a coming-of-age comedy-drama written and directed by Jonah Hill about troubled teenagers skateboarding through 1990s Los Angeles. Opening at Cinema Center is Puzzle, starring Kelly Macdonald and Irrfan Khan, which is a romantic drama about a suburban wife and mother who uncovers a new found passion for solving jigsaw puzzles. 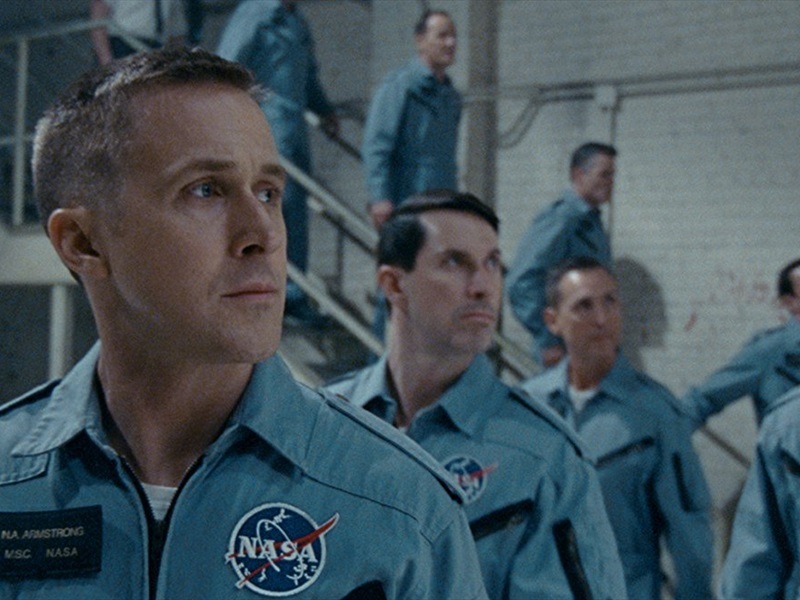 Academy Award-winning director Damien Chazelle reunites with his La La Land star Ryan Gosling in First Man, an emotionally enthralling and sensorily spectacular account of Neil Armstrong’s life leading up to the Moon landing. Not only is this a fitting biopic for an American hero, it’s also an ode to the men and women who dared to do the impossible and made incredible sacrifices so that we could extend our reach in the universe. What’s distinctive about Chazelle’s vision of space travel is how he tethers the hopes and dreams of NASA’s brightest to the overwhelmingly dangerous operations necessary for Apollo 11’s success. In addition to casting Gosling again, Chazelle has also re-teamed with the technical leads from La La Land and achieves a similar level of success with them in this film. The musical score by Justin Hurwitz is tempered with a beautiful combination of worry and wonder, led by a mournful and spellbinding theremin that recalls sci-fi movies of the 50s and 60s. It took a little time for me to get on board with the look of the film, but cinematographer Linus Sandgren does find a rhythm after a few initial missteps to produce plenty of indelible images. But the MVP from a technical standpoint is editor Tom Cross, who won Best Editing for Chazelle’s Whiplash and does a stunning job of piecing together some extremely tense setpieces. Of course it all comes back to the vision laid out by Chazelle; in keeping the action focused on the point-of-view of the astronauts as they’re crammed into their spacecrafts, he has created an experience that’s as claustrophobic and intense as any of its kind since Apollo 13. IMAX is becoming more of a gimmick than a necessity for most movies released these days, but seeing this film in IMAX is necessary not only for the enhanced picture but for the dynamic sound design that accompanies it. 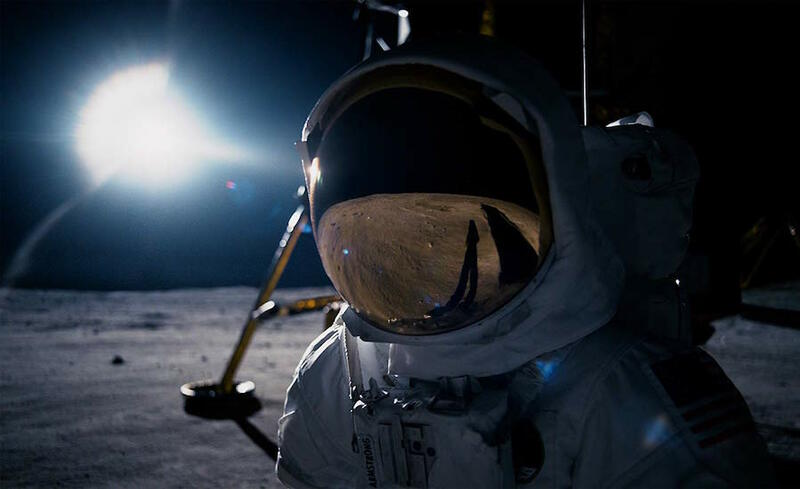 First Man is a first-rate docudrama about the spirit of innovation that led to triumphs in the past and will continue to do so in the future. The Sisters Brothers, starring John C. Reilly and Joaquin Phoenix, is a Western dark comedy that follows a pair of assassins as they track down a notorious gold prospector (played by Jake Gyllenhaal) during the California Gold Rush. I’m joined by my friend Stephanie as we blast out of orbit to discuss First Man, the new Neil Armstrong biopic from Oscar-winning director Damien Chazelle. 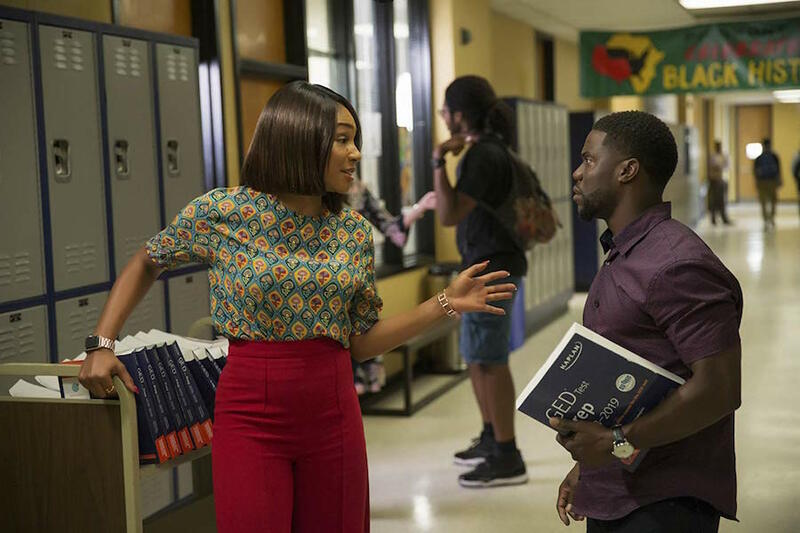 Then we discuss new options available to watch at home, including the new Netflix reality series Dancing Queen and the excellent family drama Leave No Trace, which is now available to rent. Find us on Facebook, Twitter and Letterboxd. There is a time in which Venom, the new Sony-backed superhero movie featuring a popular character from the Spider-Man comics, could have likely passed as a decent entry into the genre. If it had arrived prior to 2008, the year game-changers like Iron Man and The Dark Knight hit theaters, then it’s possible that its muddled blend of faux-gritty realism and buddy movie antics could have played as novel or even subversive. The problem is that we’ve since had 10 years of seemingly innumerable superhero films and it’s more than a bit puzzling that Sony thought they could release something this flat and uninspired in 2018. Tom Hardy bumbles his way through a thoroughly gonzo performance as Eddie Brock, an investigative reporter whose unethical practices lead to him lose both his job and fiancé Anne (Michelle Williams) in the same day. 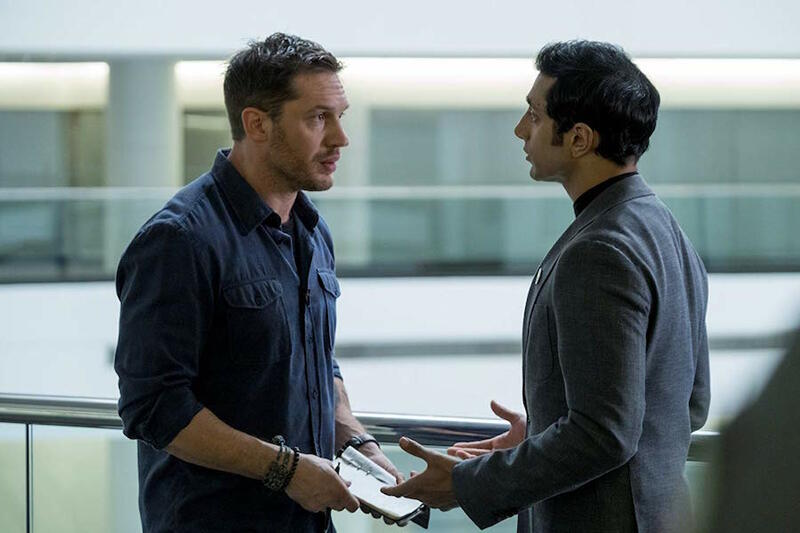 After trying to exact revenge on Carlton Drake (Riz Ahmed), the head of a shady bioengineering company called the Life Foundation, he gets tangled up with an alien entity called a symbiote and is subsequently “taken over” by the foreign creature named Venom. Now sporting a new set of superpowers that allow him to mow through henchmen left and right, Brock vows to stop Drake before he unleashes his dangerous symbiotes into the world. The big problems with Venom start with the bone-headed script, which not only regurgitates tropes that are well past exhausted by now but also bounces around from one plot point to another without a shred of logic attached. It doesn’t help that it also includes dubious lines of dialogue like the supposedly menacing “have a nice life” and the downright bizarre “ain’t nothing change but the weather”. Save for some of the bi-play between Brock and Venom, particularly one exchange that occurs at the top floor of a high building, most of the comedy falls flat and feels completely at odds with the dark and moody tone that director Ruben Fleischer is attempting to establish. Hardy, who also voices the carnivorous Venom creature, is perhaps the only person trying to do something interesting but different doesn’t always mean better. Lurching around like the alien-possessed farmer from Men In Black, he chooses to voice Brock like a marble-mouthed buffoon who can rarely stay ahead of the curve. Meanwhile, fantastically over-qualified supporting players like Williams and Ahmed are hindered by inconsistent and generally dopey characters that don’t add any dimension to the already lackluster story. Like the inky substance that overtakes the film’s protagonist, Venom also has an especially murky and lifeless look to it. As is becoming more routine for blockbusters these days, the majority of the scenes take place at night to disguise sloppy CGI and editing. The film’s final fight scene, which looks like it’s set in an exploding silly string factory, is both visually incomprehensible and unappealing. It’s another swing-and-a-miss by Sony, who leased the rights for some of the Spider-Man characters to Marvel Studios but obviously retained control of Venom on the hopes that they could score a hit sans the web-slinger. Unfortunately, I fear they will indeed have financial success with Venom, which means we’ll have plenty more cash-grabbing superhero ventures for years to come.